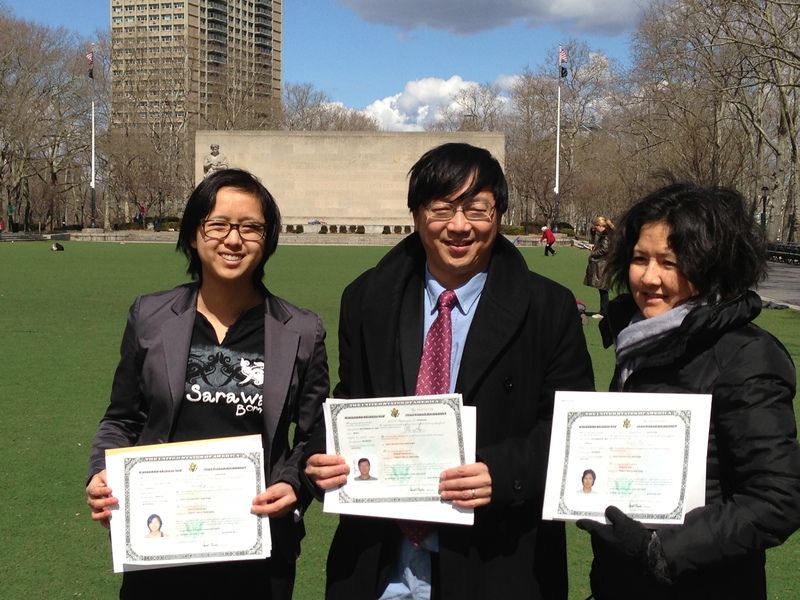 What a great day as we were sworn in as Americans on 3/26/2013 morning in Brooklyn Eastern US Court. Doreen, Sarah & myself were sworn in after a 12 years journey in America. It has been a real ups and downs journey. God has certainly amazed us in how faithful and amazing He is in shaping and moulding us and using us to fulfill the Great Commission. Well, it has not been easy, and I struggled the most during the first 7 years or so in US as I was working in America under H1 B visa. We waited for 7 years before we got our Greencard. That was a HUGE relief and it happened in 2008 just before our eldest child Sarah got in Columbia University. As greencard holders, she is eligible to Federal loan etc. It really helped and just gave a sense of security that eluded us for so long. Every single job change required me to apply for new H1B and it costs us more than $2000 each time. What a burden that I carried for years. Now I can truly praise the Lord our God for His providence. I remember on the day of the naturalization interview Doreen happened to read the chapter on citizenship in the bible during her daily devotional time and later again on the day of swearing in ( about 1 week later) she read about citizenship. Its not pre-arranged, it just is coincidental. Amazing. God is really reminding us of our heavenly citizenship! Phil 3: 20 But our citizenship is in heaven. And we eagerly await a Savior from there, the Lord Jesus Christ, 21 who, by the power that enables him to bring everything under his control, will transform our lowly bodies so that they will be like his glorious body.